One bathroom is good enough for an average family. We have no problems in sharing this space, as long as the other users keep it clean and hygienic. 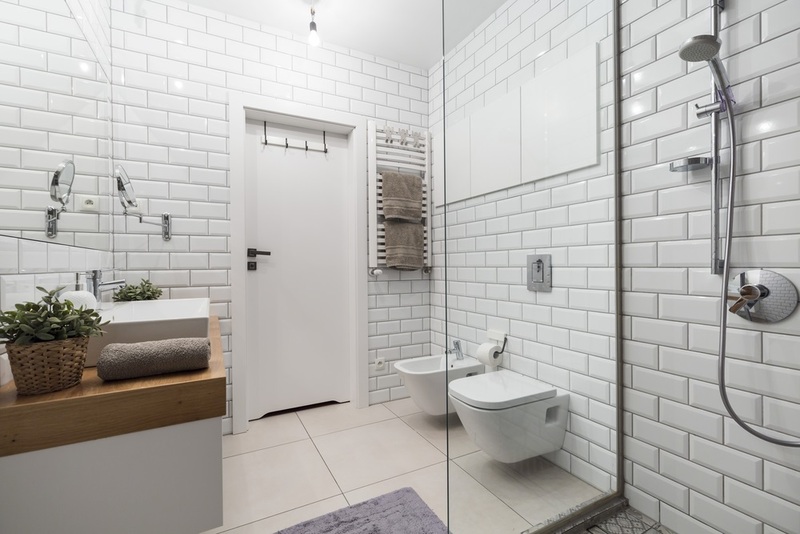 However, attaching a second bathroom to the master bedroom is slowly becoming a norm in modern houses. Homeowners can’t resist the privacy and the quick escape that an ensuite offers. Most ensuites happen when you divide a huge room or when you connect a little-used adjacent space to your bedroom. The bigger the master ensuite is, the better. You can fit luxurious features such as walk-in-showers, his-and-her basin, walk-in closets, and a sitting area. 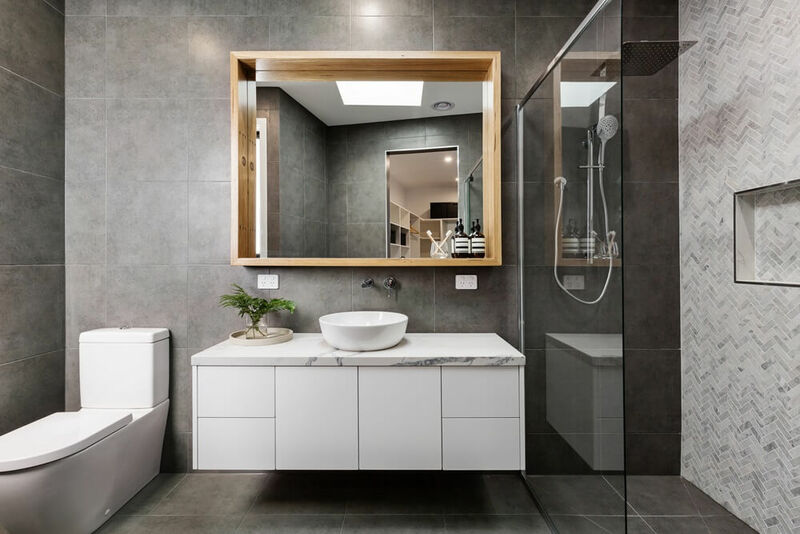 Superdraft tip: Adding an ensuite may potentially increase the value of your home, especially if you only share one bathroom. 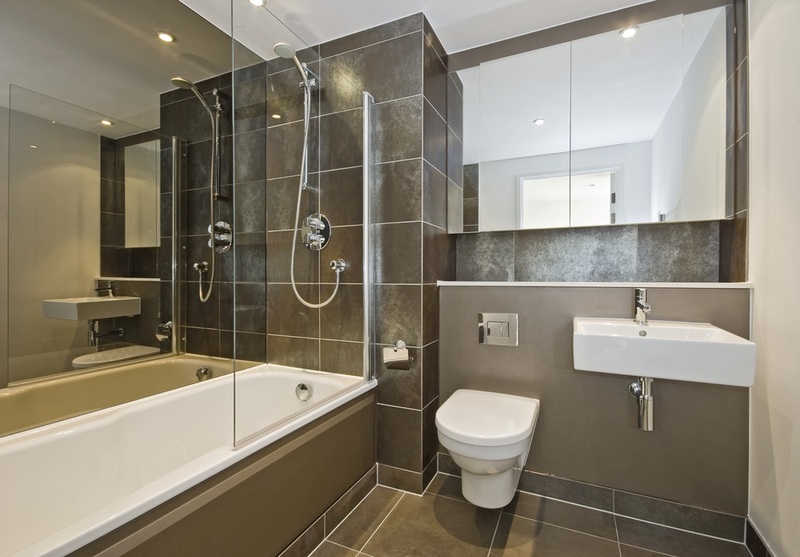 You can make a small ensuite bathroom possible. All you need is a designer who can think outside the box. Someone who can fit a shower, tub, toilet, and a powder area perfectly together for one person. Use mirrors to create the illusion of a bigger and wider space. Apart from huge bathroom fixtures, we recommend splurging on your bathroom storage. One solution is to install overhead cupboards – or medicine cabinets. These can be concealed behind mirrored, handle-free doors. You don’t (always) need to sacrifice one for the other. If you have a wall that’s at least 4-5ft. or 1500mm. long, you can fit a small tub in your ensuite. Install the shower over the bathtub so both functions happen in the same spot. Fit a glass screen to keep water from spilling out. However, make sure this screen won’t block your way in and out of the tub. 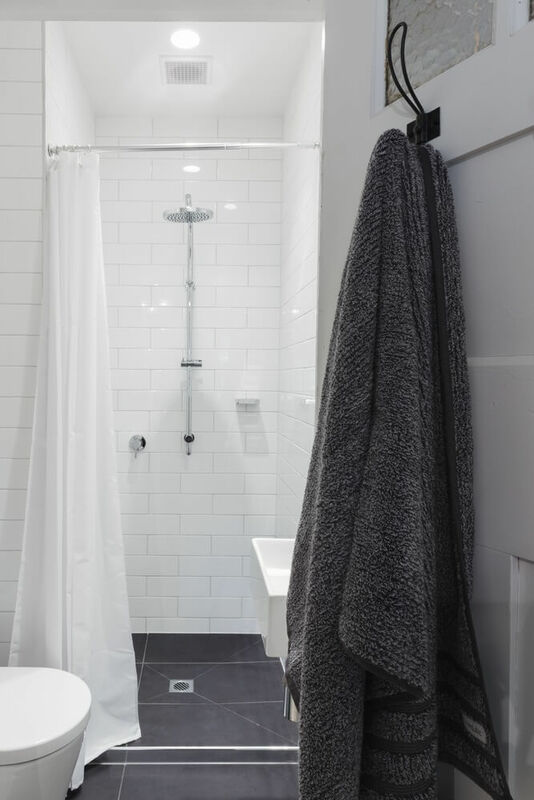 If the space is narrow and oddly-shaped, then you need to settle with a shower. A shower won’t occupy much space compared to a tub. It can also be squeezed into the most awkward areas. Superdraft tip: Lay matching tiles across the floor, including the shower. This will make the bathroom feel larger. Soaking tubs don’t take too much floor space. It’s square and deep, perfect for relaxing and warming oneself. You can’t recline in this tub but you can sit comfortably and submerge your body in the water. 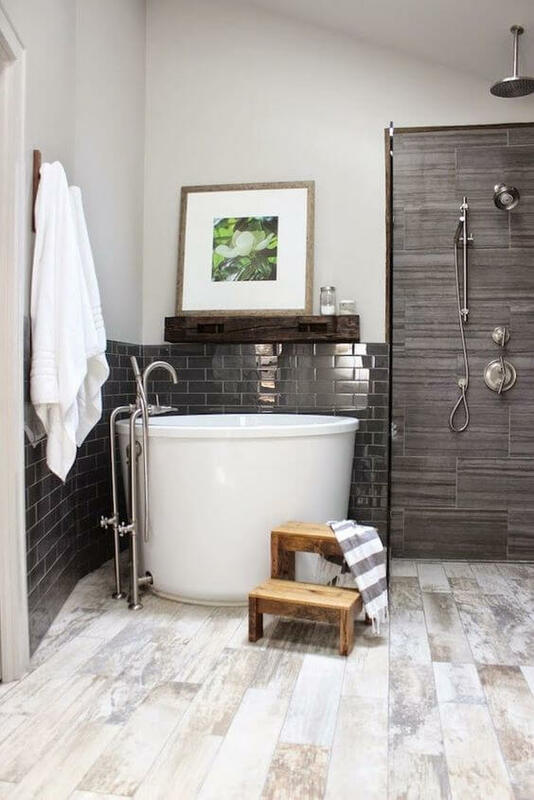 Superdraft tip: Prepare steps for a high tub such as the one above. Another option is a sunken tub. It’s easier to get in and out of. Plus, it will give you a one of a kind bathing experience. It will feel like dipping in a small pond at home. Stick with the bare necessities when you don’t have much space. Choose the pieces that make your space feel light, spacious, and airy. Go for a wall mounted toilet and vanity to save floor space. Install your tapware on the walls rather than the basin to minimise clutter. 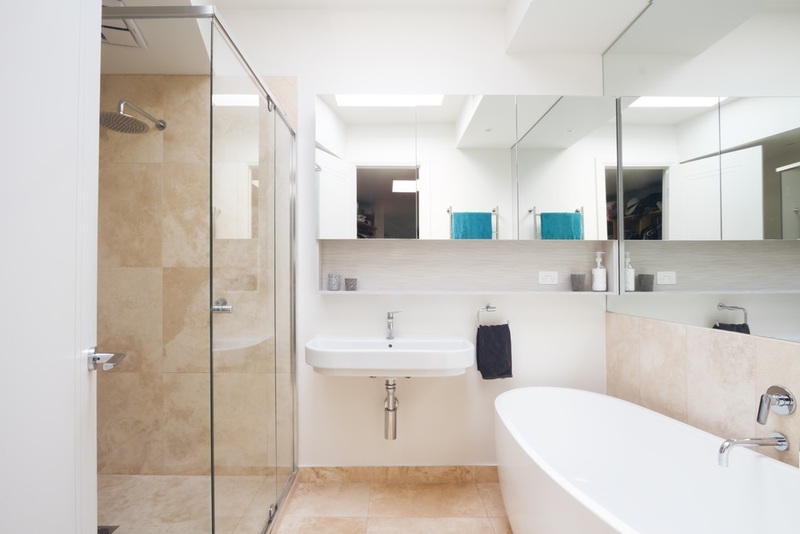 Use a frameless glass shower screen to keep a clear view throughout the bathroom.